after 2 game restarts (my memory card broke T-T screw cheap memory cards!!! ), over 45 hours of game play and sneaking to play on weekdays (i cant play video games on weekdays for school reasons) I Finally beat it!! 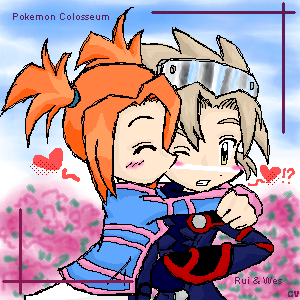 i beat Pokemon Colosseum! hahaha! and i snagged all the shadow pokemon so far ^-^ just gotta snag 6 more and purify em and i'll be done! yay! AAAAAAAAAAAhhhhhhhhhhhhhhhhhhhhhh, how sweet... WAIT!!! I've got th up, down & rite disc, i've got 2 time flutes, NOW WOT!!!!???????? SO FRIGGIN CUTE!!!!!!!!!!!!!!!!!!!!!!!! but seriousely do they startliken each other in the game?anywayz great pic you got there. Hold-up... Does she really develope a crush on him in the game? P.S.- Check out my profile. this is great! I love all your art and it amazes me what you can do on the computer, keep up the good work! icky lovie dovie pick a better topic!